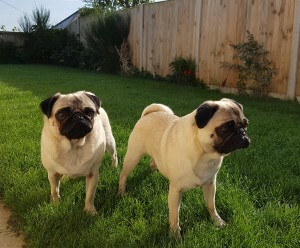 Dawn, the dog friendly holiday home is so called because the morning sun filters into the bedroom windows of this one storey, two bedroom house, and really is the perfect location if you want a holiday with your beloved pet. Imagine being able to walk out of the front gate, take a few steps to the left or right and then head on down to the dunes and beach of Hemsby. 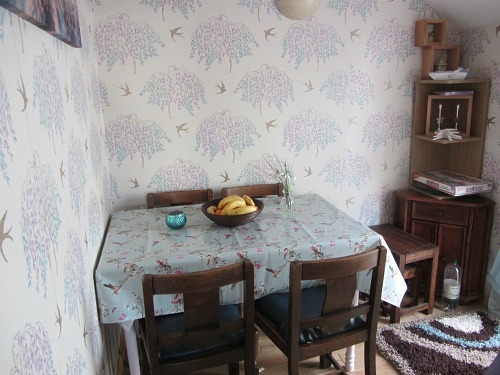 Well this is what you’ll have if you rent this newly refurbished holiday accommodation which is located on a private road called Long Beach Estate on the edge of Hemsby. 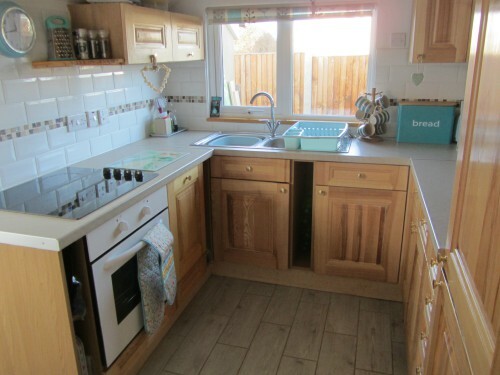 This 1930’s house has been completely renovated and extended by Sharon, the owner, and now boasts lovely wood panelled or tiled floors (great for dogs), a fantastic kitchen, 2 bedrooms (1 double and 1 twin), one bathroom, a dining room and a beautiful conservatory which catches the sun for most of the day. This is new to 2017. When Sharon acquired the property in 2015 it was an old barn sitting on the earth’s foundations. Now it is fully insulated from bottom to top and totally enclosed by fencing so very dog proof. It’s perfect for all year round. And one of the best things about this holiday home is that it also has an amazing view out to the sea. How about waking up in the morning to look out and see the sea? You don’t get that in many places. If you’re searching around for an ideal dog friendly holiday home within very easy reach of the dunes and beach in Norfolk, then Dawn is the perfect holiday home for you. It is brilliantly situated for dog walks without having to worry too much about leads. Wander across the dunes and you reach the endless swathes of sand that go all the way to Winterton and Horsey and beyond, or to Caister on Sea. It's also an excellent alternative if you're wanting to stay in Hemsby but not take a holiday chalet within a holiday park. In the winter months, there is a small wood burner which keeps the rooms beautifully warm, although Sharon has made sure that when she was renovating, the rooms are all heated with eco heaters which are very efficient and work extremely well. At the back of the house you can walk from the kitchen out onto rubber decking which is perfect for little toddlers to sit and play, without worrying about hurting themselves. The rubber decking tiles are actually used in playgrounds. There is also a nice patio complete with table and garden chairs. 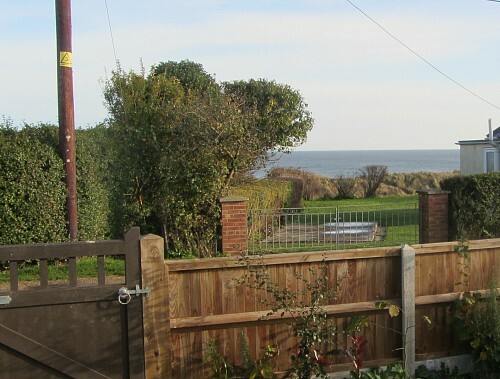 Walk around to the front of the house and there you get the most wonderful view over to the sea. 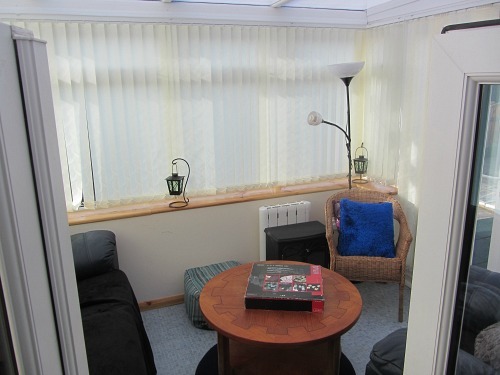 This is an airy open room with the wonderful views to the sea and the large french windows open up onto the front garden which is grassed, so dogs can wander in and out at their will. It has very comfortable reclining leather seats. 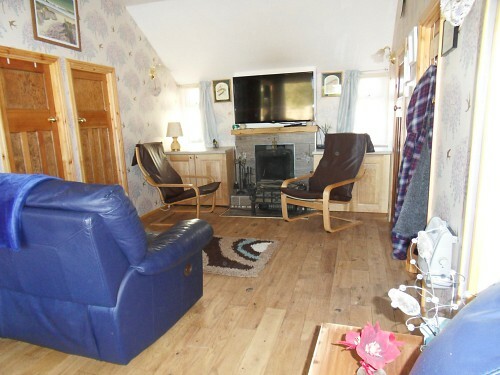 As with most holiday properties, the TV is a large smart TV with Free Sat, internet connection, you can get Netflix with your own account and connect your smart phone or tablet to it and of course there is Wifi. DVD’s are available or why not just play some games which are provided in the cupboards. In the winter months there is a small log burner, or if you would rather just turn a switch, then there is a reclaimed log electric fire. A nice aspect that Sharon has kept is that all the doors going off from this room are the original Edwardian doors which still have their lockable handles, and which have been sanded down and blend in very well with the wood panelled floor. One of the doors leading off from the sitting room is the kitchen. This has been done up really well, with lovely modern wood cupboards, all the mod cons you could wish for, an integrated fridge/freezer, as well as a microwave, a George Foreman grill, and a slow cooker for conjuring up those lovely stews or chicken casseroles while you enjoy your time on the beach! A smoothie maker too if you like being healthy! And no washing up as there is a dishwasher too. There is also a washing machine and tumble dryer which are housed in an outside building attached to the side of the house. Dawn sleeps 4 people plus 2 small children. One room has a double bed, and the other has twin beds, all with memory foam mattresses so you can be sure of a good night’s sleep here. Both these rooms also have a cube bed which can be placed anywhere you like, and would be suitable for children from about the age of 5-10 years old. 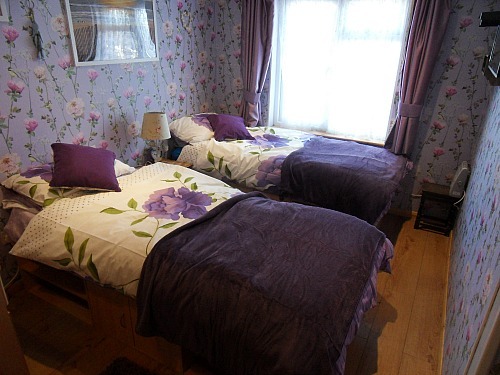 Both rooms are also a good size with space to move around and both have wardrobes and a dressing table, a TV that works separately to the one in the living room, and both also have iphone chargers. You can see more photos on the website and get an idea of the size of them here. But best of all, both have views to the sea which is fantastic. These rooms face east so why not lie in bed and wake up in the morning to the sun pouring in? Another door leading off from the sitting room is this dining room - it gives you good space to have your meals at a table. This room then leads into the Conservatory. This is a beautifully light and airy room which catches the sun from late morning onwards. In the winter months you can put on the heater which is provided, or in the summer why not open the doors onto the rubber decking and the back garden and patio. It’s a lovely space to relax and unwind especially in the leather electric recliners! You can contact Sharon for any questions here. The bathroom is very modern, with a bath (to soak those sandy feet!) and a power shower above the bath. 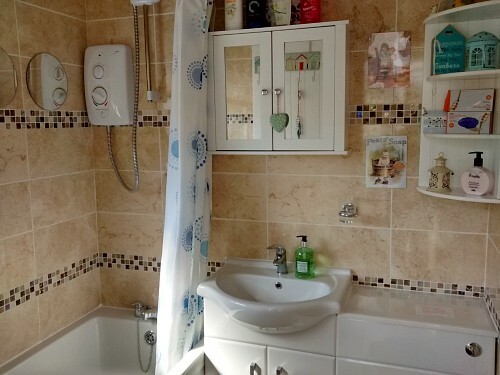 There's good cupboard space and storage and it’s tiled very nicely and, although Sharon has put in a new sliding door, there was originally a sliding door here, so this aspect of the bathroom has been retained. 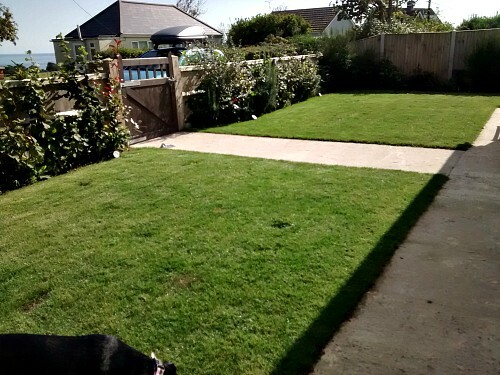 Perfectly dog proof with new fencing, grass laid to the front and a patio and gravel at the back. 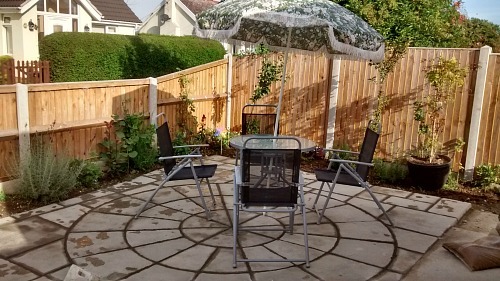 There are comfy garden chairs and a garden table with umbrella which you can use as you wish, and if you’re bringing a toddler, there is also rubber decking (playground rubber tiling) just outside the conservatory which is excellent for them to play around on. The front garden faces towards the sea with sea views and all you do is walk out of the front gate and you're practically on the slope going down to the dunes at Hemsby. What else can I tell you?! Linen is provided so no need to be filling up your suitcases and cars with sheets and towels. There is car parking for one car in the drive, and if necessary you could park another car outside the back on the private road. This is the most perfect house if you’re thinking of coming on a dog friendly holiday to the east coast of Norfolk. No worries about where you might be able to walk the dog here. You can literally walk out of the front gate, walk along a tiny little stretch of the private road and turn right and onto the dunes. You can then decide whether to walk along the “valley of the dunes” which is sheltered from the wind and is now part of the new extended Norfolk Coast Path, or up and over onto the beach and walk for literally miles both ways. 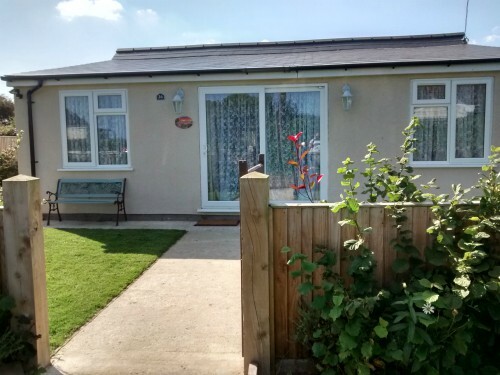 Although Hemsby is full of holiday chalets, this particular holiday home is just far enough away from these and is in a residential private road. For prices and availability, please click here. See the seals at Horsey. This is one of the biggest draws to the east coast of Norfolk during the winter months and Dawn would be the perfect place to come and stay. The seal pupping season is an amazing spectacle and you can get the chance to walk along the dunes at Horsey beach and see all these hundreds of seals and their pups at close range. 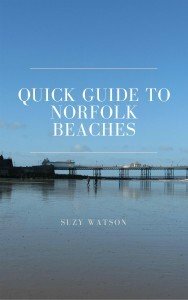 You can even walk all the way to Winterton beach and Horsey beach (but during the winter months you would need to be careful about the seals on the beach). You can read more about it here. Horsey beach is about a 10 minute drive away and Winterton beach about 5 minutes away, as is Waxham beach. All three of these beaches are also dog friendly with no restrictions at any time. Most of Hemsby beach is dog friendly, apart from a small restriction near the main entrance to the beach during the summer months. The Norfolk Broads is also a short drive away from here and is a beautiful area to explore, especially once you get in amongst the reed beds and nature reserves. Great Yarmouth is about a 15 minute drive away, with its pleasure beach and beach front arcades and amusements, plus its two piers. Why not contact Sharon to find out availability, prices and start to plan your holiday in Hemsby.